Women's Undergarments, Ruffs, Collars & Cuffs., offers patterns for 5 chemises, 2 corsets 2 partelets, 2 ruffs, 2 bumrolls, 3 collars and cuffs (sizes 8-18 included). Chemises were worn for comfort, to keep body dirt off the outer clothes, and for sleeping. They were also often allowed to show for decoration at the neck, wrist and/or through slashes in the sleeve (PP41, PP51 & PP56). Corsets, farthingales (hooped petticoats) and bumrolls reshaped the body into a fashionable silhouette. 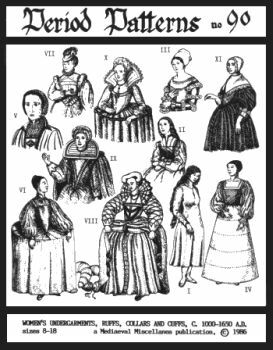 These undergarments as well as partelets, ruffs, collars and cuffs were worn for style and social status (the more elaborate and constricting a piece of clothing was, the less practical, thus denoting the higher status of the wearer). Many styles are not complete without the proper undergarments, and others will not have the right shape.